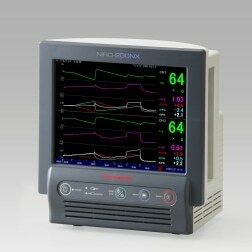 The NIRO-200NX is a tissue oxygenation monitor that uses near infrared spectroscopy. The unit uses safe, low light to measure the Tissue Oxygenation Index (TOI), showing the oxygen saturation level, the Normalized Tissue Hemoglobin Index (nTHI), showing the percentage change in the amount of initial hemoglobin, as well as changes in concentration of oxygenated hemoglobin (ΔO2Hb), deoxygenated hemoglobin (ΔHHb), and total hemoglobin (ΔcHb), all in real time. Half the size of the previous NIRO-200, providing the same great performance while making it much easier to use with an emergency cart or in the operating theatre. Data stored in the NIRO-200NX can be retrieved for purposes such as patient counseling or research. The machine can be operated by touching the screen. Data may be saved to a USB memory device, useful for analyzing the results of pump control. Measured data can be saved to an external USB memory device using the USB connector.